Balance is a tricky thing to get right. If a game is too easy, players feel like they hit a loot piñata. If a game is too hard, fun gives way to frustration. 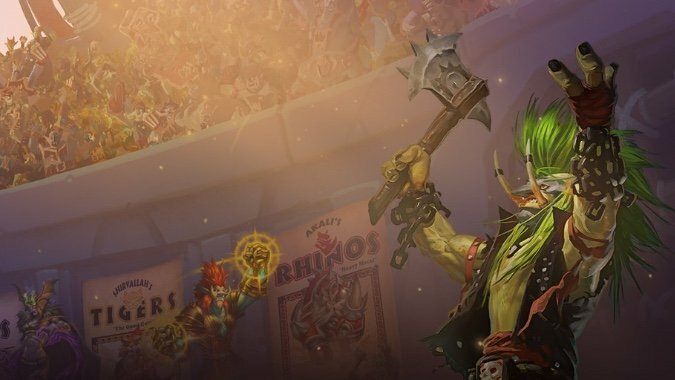 The initial release of the Rumble Run, the single player adventure in Hearthstone’s Rastakhan’s Rumble expansion, fell too far to the frustration end of the spectrum. To rectify this, the Hearthstone development team has given the latest adventure a facelift. They tweaked card options, boss difficulty, and gave you a little more choice with shrines. These are all problems the adventure has had since release, and fixing them could make the Rumble Run worth playing. 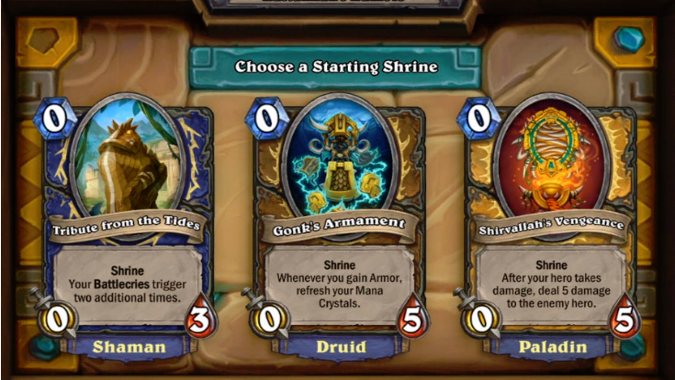 We’ve increased the possibility of synergistic cards for your shrine appearing more often. Building a deck which synergies with your shrine is the key to beating the Rumble Run, but with so many shrines available your chance of getting the right cards weren’t good. Many times you’d get card choices with no synergism at all. With this change, it should be easier to build a solid deck to support your shrine. It’s still far from perfect. After the changes, I tried a run with Jan’alai’s Flame, a Mage shrine which makes your Hero power cost zero and refreshes it if you kill a minion with it. But I still had times where none of the three card buckets offered would help my Hero power. I usually saw fire spells or spell damage to work with the base cards in the deck. And Champions — special class-based minions — proved the bigger problem. At certain points in your rumble, you’re given a choice of three different champions to add to your deck. Each are tailored to support a different shrine, but you won’t always see one which supports your shrine. I went through several runs with Jan’alai’s Flame without ever seeing the option to draft the Fan of Flames Champion, which would have upgraded my hero power damage. That would have made it easier to take out my opponent’s shrine and kill minions — which would refresh my Hero so I could kill more minions and activate my inspire cards. It also would have given me a good tempo play on turn 1, because I would have an upgraded hero power which could immediately pressure the enemy shrine. Sure, while getting all of those cards would have been overpowered, not getting any of them meant I didn’t have a deck that supported my shrine. One of our design goals with the Rumble Run was to provide huge, overpowered combat. Balancing at such a high power level is a challenge. When it works, it works great. You get epic, monumental combat against overwhelming odds. But when it doesn’t work, it feels random and swingy – like when the AI pulls an overwhelming combo. I’m convinced someone on the Hearthstone team loves combo decks. When you draw the perfect combination of cards, combo decks can provide moments of great fun, as long as you’re the one pulling off the combo. When you’re on the receiving end, you feel powerless and disheartened. It takes time to progress through all of Rumble Run’s bosses, and a single defeat sends you all the way to the beginning. These huge swings made the mode tiring and discouraging. 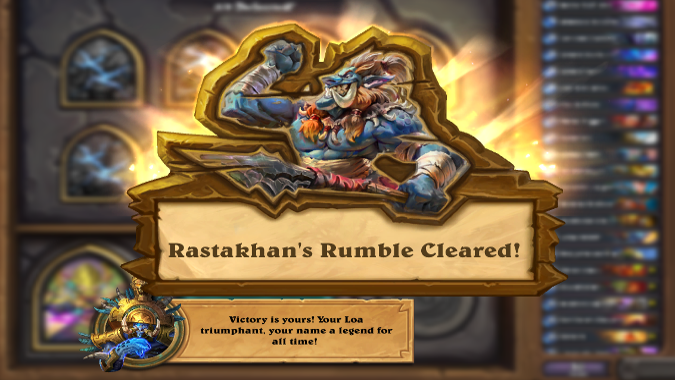 Here again, the Rumble Run is improved, but some bosses retain powerful combos which still feel “random and swingy.” Hooktusk (Rogue) and Zentimo (Shaman) both proved problematic during my runs. The random drafting is still in place, but this does give you a way to target a particular shrine. My goal was to get Jan’alai’s Flame. Once I got matched up against Hex Lord Malacrass, I checked the shrine. When I saw it was Jan’alai’s Flame, I lost the match on purpose. Next time I started the Rumble Run, Jan’alai’s Flame was available to draft, and it remained each time I lost with it. This let me play through the Rumble over and over with it. Combined with the improved card buckets, I could build more consistent decks every run. If gave me a chance to try strategies, learn from mistakes and apply those lessons to the next run. Once I got lucky enough to draft a Fan of Flames, I defeated the Rumble Run, and earned the card back. The nerfs bring Rumble Run closer to the difficulty curve of Monster Hunts and still a step up from Dungeon Runs. It’s better, but there’s still a large RNG component, especially with the Champions. But now that the difficulty has been decreased a little, I’ll see if I can beat it on a couple of classes. Remember, your own card collection doesn’t matter for this mode — all the cards are provided, which makes this a fun mode players without huge card collections. Jump in there and give it a shot.